Conor Lamb, the Democratic nominee for Pennsylvania's 18th Congressional District, has made lambasting the corruptive influence lobbyists have on lawmakers a central tenet of his campaign, but it hasn't stopped him from attending lobbyist-hosted fundraisers. "We don’t need another politician who will take orders straight from lobbyists," Lamb's campaign wrote in a January 26 campaign email. "We need a public servant like Conor Lamb who will represent the people of Southwestern Pennsylvania." In two separate campaign fundraisers on Jan. 30 and Feb. 9, however, the announced host committees were comprised of corporate money-connected members. Many of the members either directly lobby for the corporations and special interests that Lamb has accused of corrupting the system, or they work on the periphery of the government affairs profession where "consulting" and "lobbying" are only differentiated by the law requiring the latter be reported. The Jan. 30 event was a $1,000 per plate fundraiser held at the Rivers Club, a private members-only luxury sports club in Pittsburgh. The host committee for the event included numerous high profile Pennsylvania lobbyists and major Democratic donors, including Nello Giorgetti, Clifford Levine, and Lazar Palnick, amongst others. Giorgetti and Levine are the leading forces behind the government affairs and lobbying practice of Cohen & Grigsby, P.C., a law firm with a vocal presence in Pennsylvania politics. The Pittsburgh-headquartered firm has offices in Florida and is one of the largest law firms in the country specializing in corporate tax, immigration, and government affairs and lobbying. Giorgetti, a registered lobbyist since 2007, has represented over 70 large corporations, including Google. Levine, who chairs Cohen & Grigsby's Public Affairs Group, has a long history working in Democratic politics. He served as an Obama delegate to the Democratic National Committee (DNC) in 2008 and 2012, and he worked as an election lawyer for Pennsylvania Sen. Bob Casey (D.). The firm sparked controversy in 2007 after Lawerence Lebowitz, who heads up the immigration practice, was caught on camera allegedly coaching businesses on how to avoid hiring qualified American workers in favor of foreign ones. In the past, the firm's PAC has donated to prominent Republicans and Democrats alike. 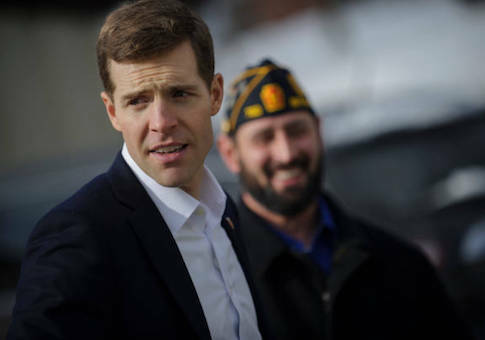 Since 2012, Cohen & Grigsby donated roughly $10,000 to the man Lamb hopes to succeed in the House of Representatives, former Rep. Tim Murphy (R., Pa.). Palnick helps clients navigate regulatory statute and election laws as a government affairs lawyer with the Luminari Team. Stretching back to his childhood in Arkansas, Palnick has long been a friend of Bill and Hillary Clinton. Both Levine and Palnick have served as presidential electors in Pennsylvania and were heavily involved in President Barack Obama's presidential campaign. The two men raised over a million dollars each for Obama's reelection in 2012, earning them top spots to the president's second term inaugural ball. The host committee for the Feb. 9 fundraiser was similarly stacked with lobbyists, including the former finance chair of Hillary Clinton's 2008 campaign for president, American Beverage Association lobbyist Alan Kessler; and Ken Jarin, the head of a Philadelphia lobbying firm with strong ties to organized labor and the Democratic Governors Association. Kessler, who also served as finance vice chair of the DNC, is a registered lobbyist with clients ranging from hospitals and healthcare groups to American Airlines. Kessler was subpoenaed in 2015 in conjunction with a pay-to-play investigation in the city of Allentown, Penn. The investigation resulted in the indictment of Democratic Mayor Ed Pawlowski by federal authorities on corruption charges. Lamb's father, who has served as a federal lobbyist for PNC Financial Services Group and is now the group's vice president of government affairs, was also on the host committee for the event. Lamb's campaign did not respond to a request for comment on the fundraisers. Pennsylvania's 18th Congressional District is concentrated in the suburbs south of Pittsburgh. The district became vacant after Murphy resigned in October in the midst of revelations of an extramarital affair. Murphy was first elected to the seat in 2002 and never received less than 57 percent of the vote in his reelection battles. He only faced nominal opposition, running unopposed in 2014 and 2016 when the Democratic Party failed to field candidates. The district has a heavy Republican lean, voting for President Donald Trump over former Secretary of State Hillary Clinton by 19 points in 2016. Lamb, a first-time candidate, comes from a well connected political family, a fact he rarely mentions on the campaign trail. His grandfather previously served as the majority leader of the Pennsylvania State Senate, and his uncle, Michael Lamb, is the current Pittsburgh city controller. The 18th Congressional District special election is scheduled for March 13. This entry was posted in Politics and tagged 2018 Election, Congress, Conor Lamb, Fundraiser, Lobbyists, Pennsylvania. Bookmark the permalink.